Who are the Yao women? There’s been a growing interest in natural beauty products for some time now, with the likes of honey, olive and coconut oil replacing conventional haircare. 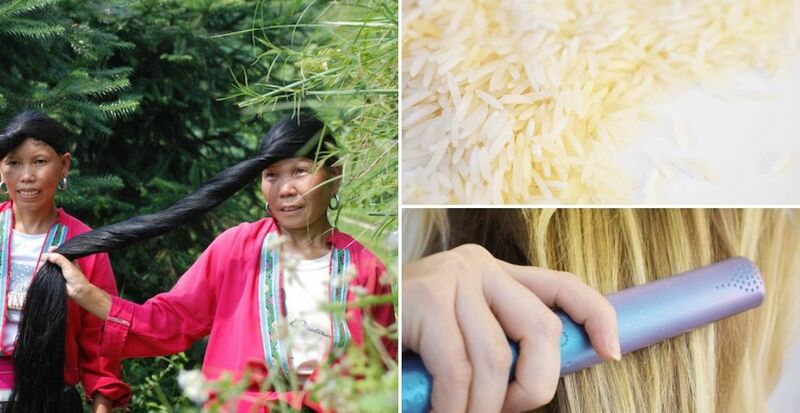 As we take a less chemical approach to maintaining the health of our hair and skin, the search for natural alternatives has taken the beauty pack to the Yao women of Asia, where they owe their famously long hair to a very natural method. Editor's Note: This post was originally posted in November 2015 and has been completely revamped and updated for accuracy and comprehensiveness in October 2018. 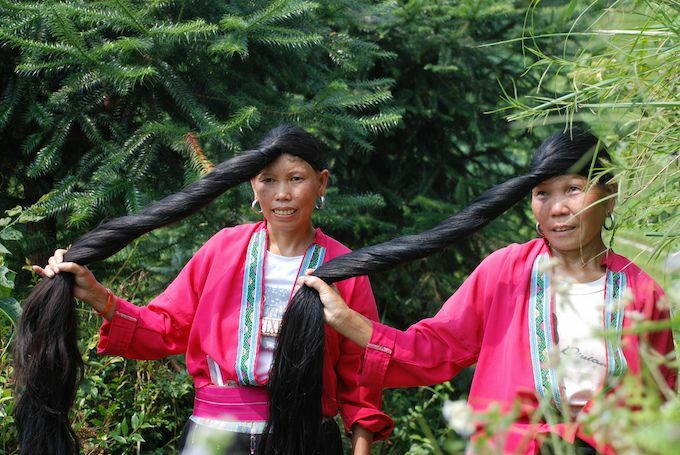 The ancient Chinese village of Huangluo is actually nicknamed the ‘Long Hair Village’, as the Yao women in this autonomous region of Guangxi are known for their long, grey-less, shiny hair. Most women in this area have hair longer than 1.4 metres, and have even made an appearance in the Guinness Book of Records. For the Yao people, their long hair is their most prized possession, believing that long hair symbolises prosperity, longevity, wealth and good fortune. They wear their hair in different styles to represent landmarks in their life, such as marriage. 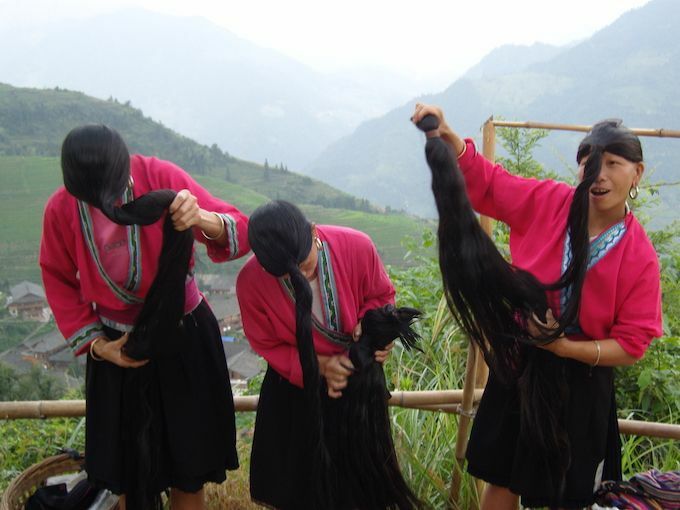 Yao women only cut their hair once in a lifetime, aged 18. The hair is gifted to a grandmother, and then returned to the girl after she is married to wear alongside her own hair, as a hairpiece - Some may say this was the original hair extension! So, what's their secret to Rapunzel-esque long locks? Fermented rice water - yes really! Yao women have been using rice water for hair for years. (Rice water is the misty coloured liquid left from boiling rice, and fermenting it makes it even more beneficial for hair). It’s been the Yoa women's secret - as well as imperial princesses in the East - to long hair since ancient times. In order for hair to grow, it needs nourishment. Amino acids are extremely important for hair growth as 18 of them are needed for the production of the protein, keratin, which requires 18 different types of amino acids. Rice water contains an impressive 8 amino acids, so it's easy to see why it's so beneficial for hair growth. Amino acids aside, rice water also contains Vitamins B - needed for strong hair - C - needed to produce sebum which keeps the scalp moisturised - and E - prevents hair loss. Prevents split endsThe hefty amount of amino acids in rice water give your hair not just the best chance of growth, but also strength. The stronger and healthier your hair, the less likely it is to get split ends - another reason to use rice water for hair! Vitamin E is also extremely beneficial for the appearance of your hair. It's known to turn frizzy and damaged masses of hair into slick, sleek and shiny, healthy locks. Dandruff can be caused by anything from stress to Parkinson's disease. Whilst it won't cause you any harm, it can be uncomfortable, and embarrassing too. Fermenting rice water then using it on your hair could prove to be an effective way of managing it. Fermented rice water can fight the fungi which causes dandruff, and rid you off those white flakes. Hair styling leads to damage. Inositol is a pretty special nutrient. This carbohydrate can both remedy and prevent damage to hair, by increasing elasticity and reducing surface friction. Whether you use styling tools regularly, dye your hair or get perms, inositol could really help get it healthy again. Best of all, it needn't cost you a fortune - you can find it in rice water. 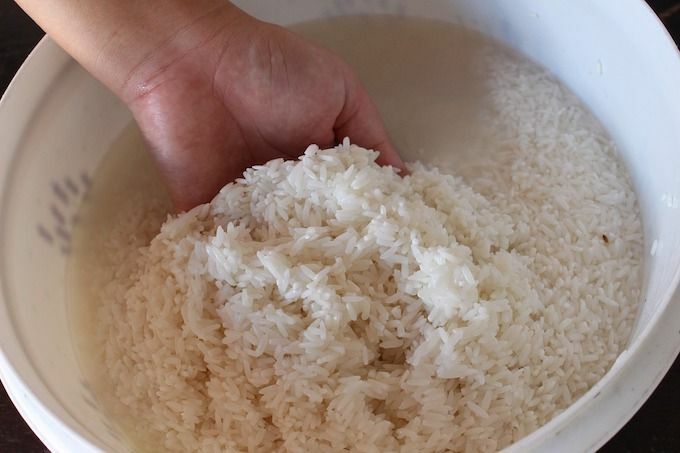 Place a tumbler full of rice in a large amount of boiling water. Boil the rice until cooked - you can use this for dinner! Strain the excess water which should be cloudy in colour. Wait until it's cooled to a comfortable temperature, then add a few optional drops of your favourite essential oils. Shampoo your hair before pouring the rice water over it. Leave for at least 15 minutes whilst gently massaging your hair. Place in a bowl and cover with water for 15 minutes - stirring occasionally. Strain the water into a plastic bottle. Leave it at room temperature for a day or until it turns slightly sour and starts to ferment. Pour into a pan, boil it then allow to cool. Add a few optional drops of tea tree, lavender or rosemary essential oils. Use the water as an alternative to shampoo by gently massaging it into your scalp and through the length of your hair. How many times should you wash your hair with rice water? If you want to reap the benefits of rice water, you need to stick at it! Thicker, shinier and more voluminous hair won't happen overnight and you'll need to use rice water regularly to really see a difference. 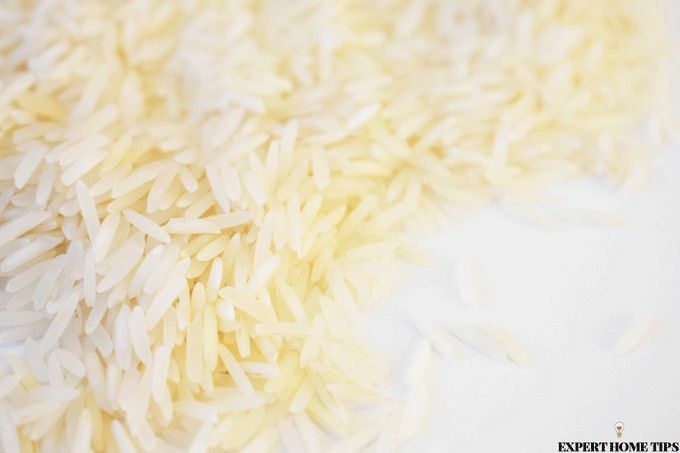 Try and make a habit of using rice water to wash your hair - rice is an extremely cheap and healthy food source, so this shouldn't be too much of a problem! Three or more times a week is desirable. According to the Guinness Book Of Records, Xie Quiping currently has the longest hair in the World. With 5.627 metres of long locks, she's somewhat of a real-life Repunzel. The record was set in 2004, when Quiping had been growing her hair for a total of 45 years! 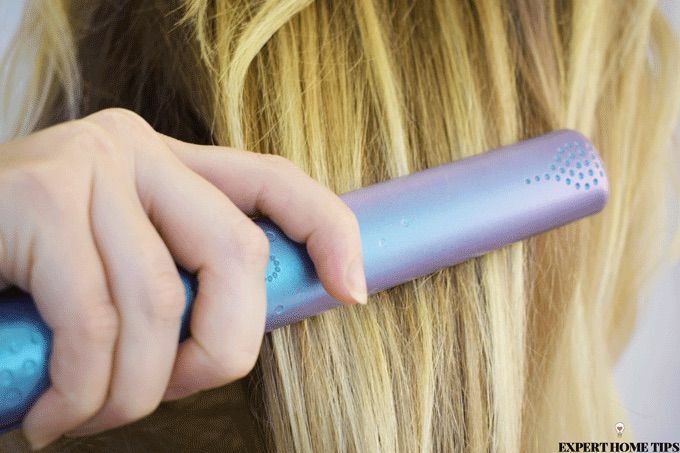 Who's excited to try this easy-peasy hair growth remedy? Share your secret hair hacks with us in the comments below. Hi Charlie! Thanks for sharing this, it's all very interesting to me. I've written about the hair growth cycle in my article - https://experthometips.com/how-to-make-your-hair-grow-faster-than-ever - and while I agree that genetics can stump your hair growth and throw you quicker into the latter stages of the cycle, you can help boost follicles with regular head massage, eating plenty of proteins etc. My hair struggles to grow but I find with a little help, I can maximise what i have and make my hair stronger that what it would be if I left it to it's own devices. Thanks for the sharing the information, it's always great to hear from readers. I agree, you can't change your genes, however you can maximize what you have. If your hair is weak due to outside influences, strengthening it can help it grow longer and healthier, because it won't break as easy. If your hair follicles are stronger, your hair will fall out less and grow healthier. So yes, science, but the same way a person can do exercises and take vitamins to help the height and posture they received in their genes, a person can improve the health and strength of their hair. The same with your skin. You have a certain skin condition at birth, but you can improve or change it with products or vitamins or the like. Thanks for sharing your thoughts on this Kate. I agree with everything you have said here, I know what may work for myself may not work for everyone but I think it's worth trying. We can always help boost what we have been blessed with. Even just diet changes can have a dramatic effect on the appearance of hair. If I eat a protein rich diet for a week I will notice by hair is shinier than before. For me the fermented rice water has thicken my hair,strength my hair my hair has received growth in a short amount of time. Rice water ph level is 4 also I also use aloe vera gel as a leave-in conditioner. I finger comb the aloe throughout my hair twist air dry. Then untwist my hair adding Camille Rose Almond Jai to each twist tuck away my ends repeat each week with washing with black soap. I also rinse once a week with rice water no washing only rinsing. I love what rice water does for my hair. I just recently add some herbs to my recipe. ???????????? I don't mind trying the rice water challenge, but what kind of rice? Jasmine? Brown? Whole grain? I need a lil bit more info! Thanks everyone! Hi Diva! White rice works best. Hi Anushka, In the second point of the above article, is it the starch you want us to strain (collect) or just the water we use to wash the rice grains for the second time? If water, does it ferment when stored? Please provide some language on this..
Hi Krishna, it is the rice water you want to collect and leave to ferment. It will ferment when stored, yes. I have amended the article slightly so it's a bit clearer! I my hair is short and I like long hair, what are some ways I can do to grow my hair, please help me I'm in Papua New Guinea..
No worries, hope it has given you some hope. You can only try! Hi, there can I use rice water on my own dreadlocks hair? Hi Sarah! It's probably best to avoid using any treatment on dreadlocks because you won't be able to fully rinse out the hair. Locked hair is washed and conditioned just like any other hair. Please stick to replying to questions you actually have experience in and knowledge of. My hair is locked and I do rice water treatments after I shampoo and before I condition and rinse my hair. My locks are stronger and I do notice less breakage. Thanks for sharing this incite, Pia! I took some time to research the above question, and everything I found contradicted this. It's good to hear from someone with first-hand experience. That's great to hear, Annerose! Don’t abuse your hair Don’t use heat Don’t color it Don’t wash it Don’t cut it. Hair grows. Hi I am a bold man. Can I make use of that??? Thanks to you. Hi, I am a bold man. Can I make use of that?? Hi there, as far as I know it won't help male pattern baldness but it's always worth a try. I recommend scalp massage. Hi Sana, I can't be sure on this. I would assume it would be fine on coloured hair, but I would recommend doing a strand test at the back of your head to see if there are any adverse reactions. One more question.. Should I stop shampooing my hair with a start of this treatment? Hi Sana, the rinse is an alternative to shampoo so I would avoid shampooing on the days you use the rice rinse. Hey ...I am suffering from hair loss since 7 years and m 22 now ...my hair are very thin and roots are very weak ...I have tried almost all natural things and even applied minoxidil which helped me a little but after stopping its use I suffered even more hair loss...I have braid of finger width and when I comb my hair they fall out like anything !!... Will this recepie help me?...and can I use it on a regular basis like everyday?...plz help me out!! Hi there, I'm not a hair loss expert so I can't give your any professional advice on this. I'm so sorry to hear of your hair loss, I would say Minoxidil is your best bet but it is for long term use. I would suggest gently scalp massage but in this case I'd recommend seeking professional advice. Good luck. Does the water from brown rice work as well? I never cook white rice anymore. As far as I know white works better, but brown can be used as well. It may be helping to retain length not grow hair. Hi. I am an african woman. And my hair is very short. It grows only up to the puff level. Can fermentated rice water help. Hi Amo, it should work too. Please try it and let me know if it works for you. Hi. How do i go about it. Do i boil the rice then i collect the starch which i wil store for a day or two. When will the effects start showing. Week, Month? Hi Cherry, everyone is different but I noticed a difference pretty much overnight and my hair was noticeably longer in a week. Cooked rice water or washing rice water? I do I use it? After use How long take it to hair long? Hi Jasmine if you follow the instructions on how to prepare the rice water, it's in the article and tells you how to do it. Hi my name is Jacinta from Kenya and my hair very short if i use only rice water without Tea drop or Roseflowr it can work or Not? Hi, Anushka, I watched video's on YouTube on how to make the rice water, but I also watched the Yao women video and their method is much different. They say to ferment the rice water for a week. and use pomelo peel, and tea seed oil, I want to do it their way. and Is the water being fermented without the rice in it. And is the rice water soaking with the rice in it for just 24 hours? Please help. You can lengthen the anagen phase through topicals. Upregulating VEGF does it. These women, though, are just Asian, wear protective styles, and don't cut their hair! I just thought I would share, every since I was a teenager living in New Mexico we were instructed to sleep with a fairly tight French braid for faster hair growth. As with topical stimulation I assume this is beneficial for the anagen phase? Thank you for the article about Asian beauty crowns, and enjoyed the information from reader, Charlie. Oh no sorry to hear that. I hope these tips will help you! I love your page, great stuff really! But a quick question. Do I store the water while it is fermenting in a closed lid bottle or open? do you condition after using the rice water? yes you can condition afterwards if you like. It just says add water it doesn't say how much water to mix with the rice. And how often do you use It per week? Do you leave it in your hair or just rub in and rinse off? Hello Laura! Just follow the instructions on the packet of rice regarding how much water to add. You can use it as much as you want or as often as you wash your hair. Leave it on your hair for a few minutes and then rinse. Hi Disha, that sounds like a pretty good haircare routine you've planned out there. Can you keep us updated and let us know how you get on? Hi Denise thanks for sharing your homemade hair soak with us! It sounds interesting, I will have to look up the benefits of orange peel. I like this story. I went threw a horrifying episode in my life when all my hair fell off my head. I found out later that they had given me radiation therapy when in the hospital. I wore wigs for two months while I took vitamins for my hair. It works now after just 3 years My hair is to my but-ox and it this will help me I will do it to love it. Before I had gone into the hospital my hair would grow shoulder length and break off and I had not cut it in over 25 years. I long my long hair and wouldn't trade it for anything. Hi Rebecca, thanks for sharing your story. I'm pleased your hair has grown back and stronger than ever! I tried your secrets now my hair grows 3 to 4 and half inches a month. Thanks! Amazing! Hi, my hair has been falling off after every hairdo thats braided. Never grew the same length. So I cut them extremely short. Will this rice remedy help my hair? Hello. I have previously had tailbone length hair, when I did not take care of it. I cut it for the first time this year, and have kept it medium for a while. I am hoping to grow it out again, past where it used to be when I didn't take care of it. It took me 6 years from bald to grow it out to tailbone length last time. I know growing out your hair mostly just takes time, but do you have any tips? I have dense, fine, low porosity, curly hair. P.S. I am also a serious competitive swimmer. Thanks! Hi there, can this fermented rice water be used by males? Hi Victor, of course, it can! If you're aiming for long, luscious locks then go ahead and give it a go. Hi I'm lovia ,when I braid and unbraid my hair some of my hair gets removed from its place, I want to known if this method can help. Hi Lovia! We're sure it will help! Give it a go and let us know how you get on? This is really good and informative. Thanks for sharing. Hi, Good morning. Does this lather?? I oil my hair regularly. Will this remove the oil??? Hi Michelle, it won't lather in the same way that shampoo does. It is just a blend of rice water and optional essential oils so it's definitely not as thick as shampoo either. It should remove the oil, but you might want to use a little bit of shampoo to get rid of the oil too. As a new user how long before i see new hair growth or how many months before my hair see growth. Hi Rebeydory! You should notice improved hair growth in 1-3 months of using this method. Great tip! I have just been using the rice water for two weeks, and I am amazed at how my hair that is recovering from the application of harsh chemicals has strengthened. Before the rice water treatments, I used to have so much breakage, but now when I comb my hair, there is little to no hair left on the comb. I can't say much about growth yet, but I can attest that it helps to strengthen my hair. I also believe it will help it to grow as well. That's amazing! Glad it's working for you, Sid! Hi Juliet! Rice water can be used as a replacement for conditioner, so you should notice that your hair is smoother after use. Thanks for the info....but can ii use any rice? Hi there! You can use brown, red, black, white or wild rice to make rice water. Wild rice and red rice are the most nutritious but white rice will leave more starch, which is desirable for home remedies. Hi Frances, yes you can! Hi Naz, I've seen a few testimonies from people with the same hair saying that it works. Let us know how you get on! I have not done this before,what I do use is egg mask. nd its really working bt if I try dis rice water would it work nd which one would work better, is it the boiled rice water or the fermented rice water. Hi Mary! I think you might find rice water works better, but any hair treatment is completely personal and may not work for everyone. Hi Melody. You can use any hair conditioner. Thanks for getting in touch! I began using rice water treatments and can see the growth and thickness it adds to my hair. I am natural and love wearing my own hair. I'm definitely going to give this rice water a try on my 4b hair and see the results after three months. Let us know how you get on, Ellee Lu! Today I have used rice water for the very first time and I love how soft and silky my hair feels. I feel tempted to always touch my hair. :-) I almost can't believe. I was a bit worried at the thought that maybe rice water is not good for my hair. I know that rice water is good for most of the people, but not just for everyone. So I was a bit nervous at the thought that I might be one of those unhappy exceptions. I used fermented water but I did not boiled it at the end. I fermented it for several days (I had some problems and I had to postpone my hair wash day), so it turned kind of sour. The unpleasant part of this is the smell. My nose is pretty resilient to bad smells, but this water DOES smell bad. So, considering the fact that I was supposed to sit with that stuff on my head for a t least 10 minutes, I have decided that I don't want to put a padlock on my nose, so I have added several drops of mint oil. Maybe too many drops because my scalp was then feeling like on fire, only that it was a cold fire. Anyway, I have survived and here I am. Yup. I'm so glad that I have discovered this! That's great to hear, Margie! I'm getting bald do i should try this.... i mean now! Lots of love...... thank you for this very informative article. Great to hear Nkem! Thanks for getting in touch. Anushka F: What is the purpose of boiling the rise after it is fermented? Hi there, Iris! This step is actually optional. Some people say it makes the fermented solution more effective, but others see no noticeable difference between boiling and not. Everyone has different hair, so try it and see what works for you. It works really good. Thanks for the information. Thank you for sharing this, and I’m a little late to respond, but I’ve just started using rice water. I see on YouTube there are various ways of making it, with people and in various extra ingredients. For me, I must say my shed and has stopped tremendously. My hair feels stronger, and now there is noticeable growth. I contributed to making my hair stronger, and less breakage. I like the way my hair feels now, and I have been using it for four months. I can say there is a noticeable difference, and finally my hair looks thicker. I have found out that the younger women prepare it a bit differently. They take the water from washing the rice, and ferment that for five days with the deposits in the water, then I add Pomello leaves and boil it for 15 minutes, and then I think there a sequel it was crushing up some type of tea seeds in there and then that to wash their hair. That's great to hear, Lori! Hi, Should you dump out the left over rice water after using what you need? Or just let it keep fermenting and use it till it’s all gone? Hi Cassie! It's completely up to you.